Turner's House at Sandycombe Lodge Historic HouseJMW Turner, one of England’s greatest painters, fulfilled a little-known aspect of his artistic ambition when he built Sandycombe Lodge near once-rural Twickenham, to his own designs, c. 1813. This small house, used by Turner and his ‘old dad’ as a retreat from the pressures of the London art world, reveals a fascinating side of Turner’s life and art. Sandycombe has undergone an extensive conservation programme and is open to the public, we look forward to welcoming visitors and sharing the many stories that have emerged. Our website gives a lot of information about this ‘unknown Turner’, including video clips on aspects of conservation. Booking details and visitor information will be put on our website, and also updated here. 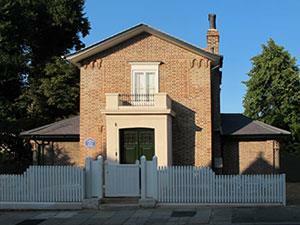 We have one car park space for disabled badge holders, by booking only – email: info@turnershouse.org. A virtual tour of the whole house available for those unable to access the upper and lower floors by stairs. JMW Turner, one of England’s greatest painters, fulfilled a little-known aspect of his artistic ambition when he built Sandycombe Lodge near once-rural Twickenham, to his own designs, c. 1813. This small house, used by Turner and his ‘old dad’ as a retreat from the pressures of the London art world, reveals a fascinating side of Turner’s life and art. Accessibility We regret that only the ground floor is accessible to wheelchair users. By public transport: St Margaret’s Station (trains from Waterloo) is five minutes’ walk away, and the 33, 490, H22, H37, R68 and R70 buses from Richmond stop close by. Visiting by car is not recommended as this is a residential area. The nearest car park is at Marble Hill Park, 5 minutes walk away.